Hillview (山景) is a sub-zone under the Bukit Batok district in the West area of Singapore. Besides being a largely private residential area, Hillview is home to 4 army camps, namely Bukit Gombak Camp, Bukit Panjang Camp, Hillview Camp and Gombak Base. Hillview Avenue was Singapore ‘s largest site for Selective En bloc Redevelopment Scheme, or SERS in short, under the Housing and Development Board (HDB). SERS was announced for Hillview in March 1999. The residents started the relocation in 2003-2005. By late 2005, the last HDB estate was demolished. Majority of the Hillview residents were then relocated to Goodview Gardens at Bukit Batok West Avenue 5. Hillview is presently moulded into a private estate with over 18 private condominiums, which are largely freehold or on 999-years lease, and an assortment of aged landed property. There is a nature trail that starts from the Bukit Gombak stadium, rises up the Guilin ridge, and ends at Chu Lin Road in the Hillview estate. Traipsing along this trail allows for a scenic view of the Little Guilin and its surroundings. The Rail Mall, located opposite Hillview Road, houses a stretch of restaurants, a Cold Storage outlet and other amenities for residents nearby. A new commercial shopping mall, hillv2, at the beginning of Hillview Avenue is due to be completed by end 2013. It will be built on part of the site where the HDB estates once stood. It will house Dean & DeLuca and Cold Stone Creamery. The nearest Mass Rapid Transit (MRT) train station is Bukit Gombak (NS3) which lies on the North-South Line, or also commonly known as the Red Line. 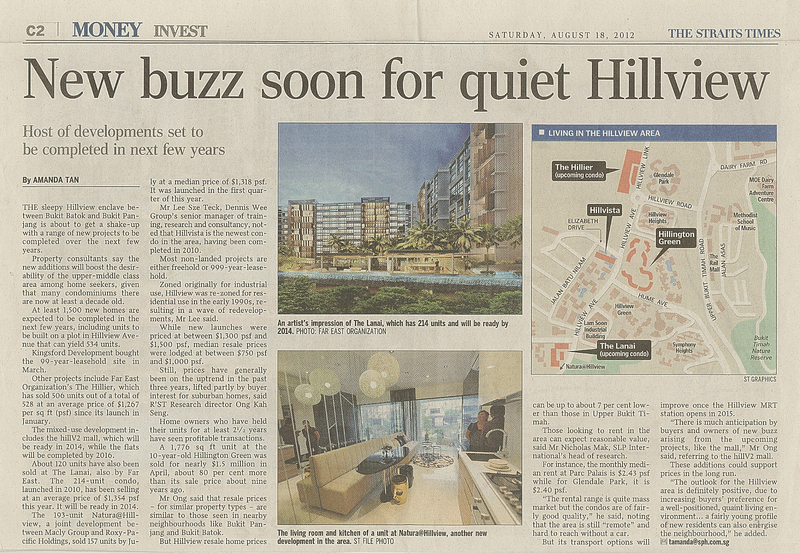 By 2015, Hillview will be served by the upcoming Hillview MRT Station via the Downtown Line.